I think this area used to be called 'Tin City' prior to urban renewal. I think those buildings are still in use are today. Mr. Mitchiner is absolutely correct. The area also consisted of Friendly City Barber Shop(Eugene Suitt), Coleman And Sons Grocery(Johnny Coleman) and B&G Grill(Ben Robinson). Wonderful area to grow up in. 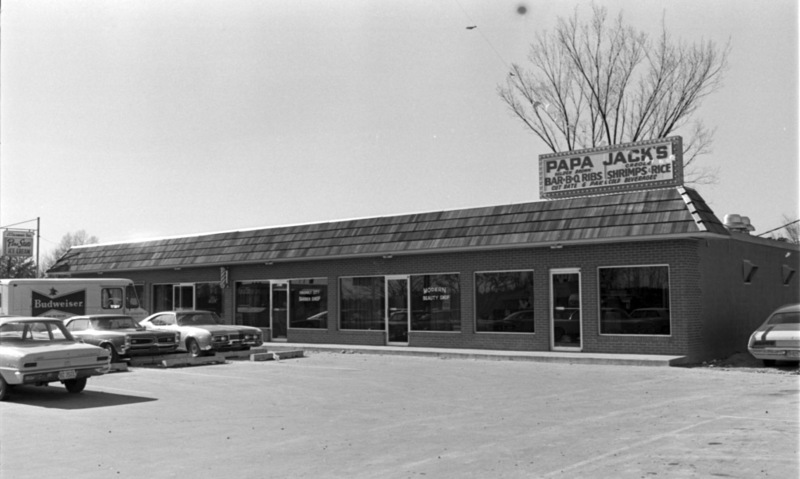 MMMMM... anyone know if Papa Jack's still in business? Easy... Modern Beauty Shop et al., 2510 Fayetteville St. opposite St. Joseph AME Church near intersection of Fayetteville St. & Burlington Ave. The businesses in this small strip mall were indeed relocations of existing small businesses that existed along the original Fayetteville St./ Pettigrew St. corridor prior to being displaced by 'urban renewal' and subsequently the Durham Freeway/ NC 147 in the early 1970's. I believe Tin City was in the Hayti area, and the building shown is in the area called Pearsontown. Correct on Tin City- I'm gonna throw out the 700 block of South Alston Ave. Looks similar.